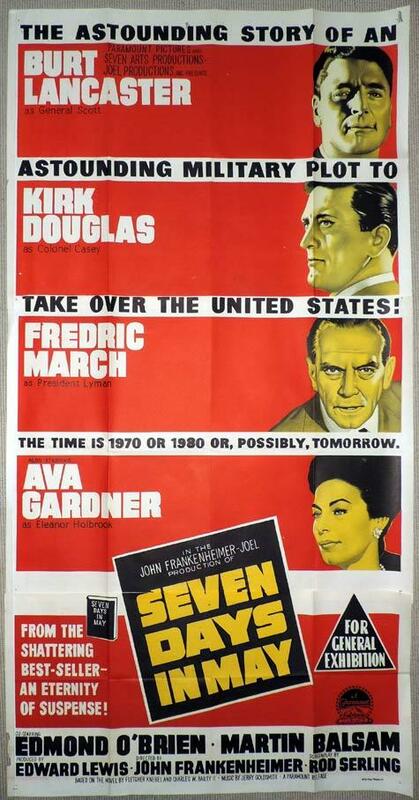 Seven Days in May is tightly wound thriller. OK, hopefully, we are back on schedule. As I work on this, I am preparing to go to Austin for ArmadilloCon. This will be the 39th ArmadilloCon, and I have been to them all. Not many can say that. I will be on a couple of panels, including one with my buddy Joe Lansdale, and I will be reading my Western Mythos-type story “Giant Scorpions From Hell!” sometime Saturday. This means I am doing this column four days early. So I had to watch a movie earlier than normal. Oh, the horror! Fortunately TCM (the greatest cable channel ever conceived!) provided me with several options last weekend. I watched The Cheyenne Social Club with James Stewart, Henry Fonda and one of my favorites, Shirley Jones. I also took in Twelve O’Clock High with Gregory Peck, Dean Jagger, Gary Merrill and many more. Those were both fun films, and I would have prefaced a review of the Shirley Jones movie with the story of Sandi and I going to see her at the Fairmont Hotel in Dallas in 1981. We should not have done it. We were broke at the time. We had enough money for the tickets and dinner, but none left to pay for hotel parking after the show. The kind lady there let us slide, and we had a great evening. We lowered the average age of the audience by about ten years, but I loved it. And Sandi loved me so she went along. And that was one of many reasons I love her! But I’m not going to tell that story. I grew up in a very small town in Texas. One that makes Alpine, where I currently live, and its 6,000 residents appear large. As I entered the combined high school and junior high, I was amazed by the size of the library. I had been on military bases before so school libraries were small and wanting. (This may account for my own obsessive hoarding of books.) There were not many things to do in town so I read. A lot. One of the books I read was a political thriller, Seven Days in May, written by Fletcher Knebel and Charles W. Bailey II. As part of a military family, I found the story gripping. When the film came out, I wanted to see it. But, out of the family, I was the only one. So I did not get to watch it in the theater. The nearest screen was more than 10 miles away and I was a preteen so it was not in the cards. I did eventually see it on the TV some years later and I loved it. The cast is superb on all levels. President Jordan Lyman (Fredric March in one of his last roles) is facing a crisis in popularity. He has made a disarmament deal with the Russians many disagree with, particularly the military. Among his toughest critics is General James Mattoon Scott (Burt Lancaster), chairman of the Joint Chiefs of Staff. Scott’s aide, Colonel Jiggs Casey (Kirk Douglas), agrees with him. It is early May, and a major drill is planned for the upcoming weekend with the President and the Joint Chiefs going to Mount Thunder to observe how the alert is handled. The President has even agreed to keep the media in the dark so none are on hand during the alert. Strange things unfold. A young communications officer tells Casey about a Preakness betting pool that involves most of the joint chiefs. An old friend mentions that he is the exec at a military installation Casey is unaware of. The General lies to him about some visitors. People get upset about the betting pool. Senators know things they should not. Casey has stumbled onto something nefarious. The drill is set for Sunday. And by Wednesday he is convinced that a potential coup may be in the offing. But it is well planned and every angle seems to be covered. There is nothing concrete anywhere. I really like this film. I watched it with Sandi, who normally does not like this type of film but was riveted by this one. All the way to the end, you are unsure how things will turn out. And the supporting cast includes Ava Gardner, Edmond O’Brien, Andrew Duggan (a favorite of mine), John Houseman, Martin Balsam, Whit Bissell and Hugh Marlowe. Wow! All of them do a great job keeping the tension going. If you’ve seen it, you know what I mean. And, did I mention that Rod Serling did the screenplay? Go forth and watch.